Leather Gauntlets and Hand Armour - High quality Leather Armour Gauntlets and Half Gauntlets suitable for SCA fighting, LARP Events, Re-enactments and Faires. Armour grade Leather Gauntlets. Fully articulated leather forearm protection. Our Leather Demi Gauntlets are made from 13-15 oz armour grade leather or lighter 8-10 oz LARP leather plates. 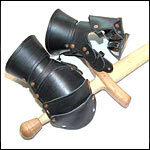 These Leather Half Gauntlets meet SCA standards and fit nicely into rattan shield baskets. One size fits all! These fully articulated leather mitten gauntlets are styled from armor of about 1450. Made from 13-15 oz leather plates, they include internal leather straps and come with articulated thumb plates. Ties at cuff. Leather Viking gauntlets designed for a true Norse warrior. Vegetable tanned leather armor plates and soft leather, allows for mobility and comfort. Embossed designs and antique rivets add a touch of detail. Great for LARP or Stage. These fully articulated leather mitten gauntlets are styled from armor of about 1450. Made from 10-11 oz leather plates, they include internal leather straps and come with articulated thumb plates. Ties at cuff.